Public companies keep two sets of financial statements, one for shareholders and one for the government (for tax purposes). Shareholders mostly ignore the set of statements kept for tax purposes, but in so doing they may be ignoring critical information. While most shareholders are not privy to the company's statements for tax purposes, companies do have to list differences between the statements in the notes to their financial statements for shareholders. 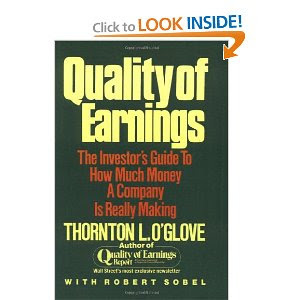 O'Glove describes how the info in this note can be useful in better estimating a company's earnings power. The author goes through several examples of companies where differences between the sets of statements were quite large. These differences led him to believe that earnings were either drastically under or over-reported. For example, GE showed high taxes on its shareholder returns, but because of growth in its leasing subsidiary, it was able to consistently show high depreciation for tax purposes, resulting in the payment of almost no tax. As such, its earnings power was actually higher than the reported EPS number suggests. Other companies showed differences in revenue recognition and the capitalization of costs (for example, for oil and gas exploration) that would have been a red flag for shareholders who bothered to dig into the details. O'Glove was able to foresee writedowns years into the future by diligently interpreting the financial statement differences.